A premium grade polypropylene freezer storage box with lid. Rated to -90oC and will fit in standard 5.25" square freezer modules. The microtube freezer box lip is alpha- numerically matrixed with 1-9 and A-I characters. Specifically designed for easy on and off access. 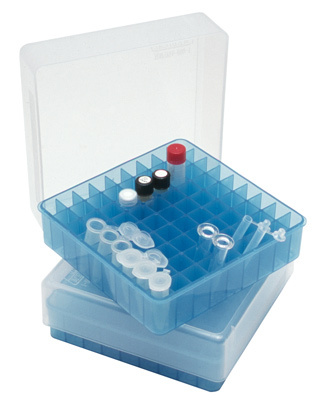 Accommodates 1.5-2 ml microtubes, standard cryovials and 1.5mL(12 x 32mm) vials. It features a colored base with a CLEAR LID. Rack with closed lid will hold a 12.3 x 47.6mm vial, but will expand to 60mm. Empty rack measures 5.2 x 5.2 x 2.1 inches. They are sturdy, see-thru & stackable.